Here is a look at the real estate market report for the Scottsdale, AZ area. The average sale price for single-family homes and condos in Scottsdale in March 2019 is $606,258. In March 2018, the average sale price was $574,180, which shows a year over year increase of 5.6%. The average sale price for rental listings in Scottsdale in March 2019 was $2194, which is just slightly higher than March 2018, $2187. January 2019 average sale price for rentals was $2242, and February 2019 average rental sale price was $2307. Scottsdale is located within Maricopa County, reported by US Census data to be one of the fastest growing counties in the US, with the highest number in the country for net growth. The annual population increase will continue to keep demand strong and supply low, which is good news for the Scottsdale homeowner concerned about rising home values. However, the market continues to be a challenge for the first-time home buyer, with fewer homes at the lower end of the market. In March 2019 768 single-family homes, condos and townhomes were sold in Scottsdale. Total properties sold in Scottsdale in March 2018 sold was 879. The average days on market for homes, condos and townhouses in Scottsdale for March 2019 is 96, which is down slightly from a year ago. 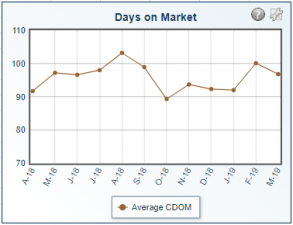 Days on Market is the average number of days sold listings were on the market. The total number of new listings in Scottsdale in March 2019 was 1119, with a total of 3103 active, and 768 sold, showing our current inventory is just slightly higher than last March. Sales were slightly lower this time last year. The average original list price is 97% of the close price for homes in Scottsdale and the same for condos/townhomes. Please visit the Cactus Valley Realty website for the National, Maricopa County, and the greater Phoenix Metro Area real estate market report .